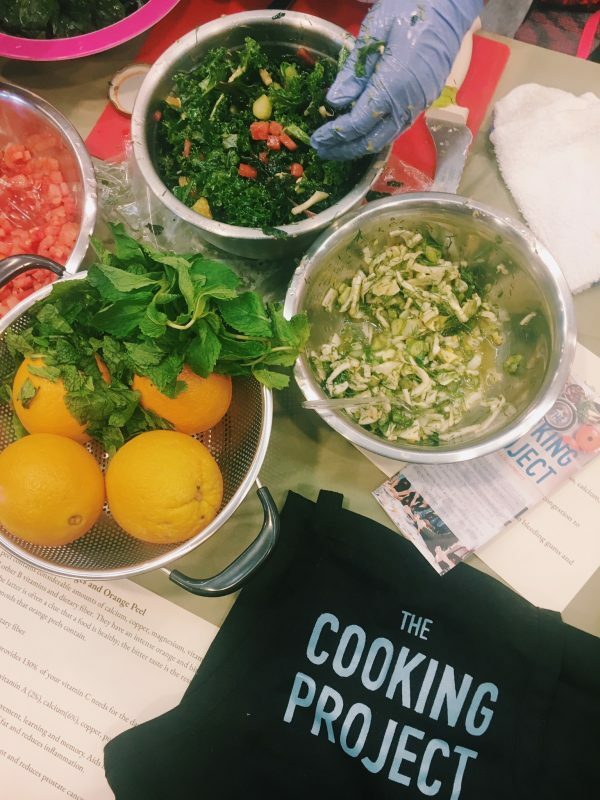 On June 8 the Cooking Project team set up a cooking demo booth at the “Design Your Wellness” event at the Zuckerberg San Francisco General Hospital. Our Program Coordinator, Chef Sicily Sewell-Johnson showed participants how to make a kale salad by massaging or rubbing the kale leaves in a vinaigrette to break down the fiber and release its nutrients. We balanced the flavor by adding summer fruits, mint, and fennel. Most importantly, we highlighted the nutritional benefits of each ingredient to prove that food can also be medicine. Packed with Beta Carotene (beneficial for eye health), vitamin E and C (most servings of kale offer more vitamin c than an orange). High levels of vitamin A (vision, skin, and helps prevent lung and oral cancer), and antioxidant. A great detox food (thanks fiber and sulfur) — Isothiocyanates (s the chemical group –N=C=S, formed by substituting the oxygen in the isocyanate group with a sulfur) – which defends against the growth of tumors! High in iron – essential for hemoglobin, enzymes, transportation of oxygen. Helps pregnant mum’s boost their Folate intake – protects infants from brain defects and promotes healthy neurological development. Fortifies your bones – this is especially essential for vegans as, they do not drink cow’s milk. Orange peel contains considerable amounts of calcium, copper, magnesium, vitamin A, folate and other B vitamins and dietary fiber. They have an intense orange and bitter flavor, but the latter is often a clue that a food is healthy; the bitter taste is the result of the many flavonoids that orange peels contain. Vitamin C – 1 oranges provides 130% of your vitamin C needs for the day. Choline – helps sleep, muscle movement, learning and memory. Aids in transmission of nerve impulse, assist absorption of fat and reduces inflammation. Zeaxanthin and carotenoids – antioxidant and reduces prostate cancer. High in Fiber – 7 grams of dietary fiber or 28% of daily needs. In ancient Chinese medicine it is used for a variety of ailments from congestion to helping increase the flow if breast milk. Prevents scurvy – the inability to properly form collegean; leading to bleeding gums and bleeding below the skin. Aids in digestion, upset stomach, bile flow, respiratory disorders, breastfeeding, oral health. Treats nausea, headaches, asthma, depression, fatigue, memory loss, congestion, memory loss, allergies and hay fever. Flavonoids – packed with antioxidants and aids with weight loss. Strengthening immune system, delaying onset alzheimer’s, improves cholesterol, reduces swelling, address hair loss, eczema, acne, speeds wound healing, and phenolic procyanidins. Contains lycopene (antioxidant that can protect and repair the body from damage caused by a multiple diseases). In a container with a lid, pour in apple cider, grapeseed oil, orange zest/juice and salt. 2. Put lid on container tight and shake well. 1. Use 1/4 c of dressing and “massage” the kale and let sit while you prepare the rest of the salad. 2. In a larger bowl, add orange segments, watermelon, mint, fennel, and mix well. 3. Pour over dressing and combine again. 5. Mix well and pour over dressing and garnish with pepper.